Bali Hotel Komaneka Resort is the natural style hotel that expresses comfort of Bali. It locates little apart from the denter of Ubud, so it is the high class resort with great view, silence, and the big size of room comparing with other resort. 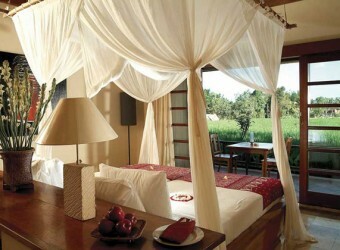 The villa has familiar atmosphere with the soft mosquito net. Moreover, the restaurant is particularly recommended.